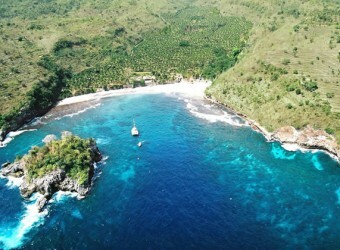 A famous island for Crystal Bay, Nusa Penida Island is located next to Lembongan Island. You can enjoy snorkeling in the beautiful clear ocean with corals and a relaxing moment in the nature. It has a popular diving spot to meet manta in the south of the island. It`s a beautiful island! So far I`ve been to Lembongan Island only, but Nusa Penida is also a very good place. I`ll go to Nusa Penida Island when I go to Bali again next time. I went to Nusa Penida for diving. The clarity of the sea is excellent, very beautiful. A variety of corals and many big fish! I was impressed when I met the sea turtles. It was rainy season when I came here. I want to come here again in dry season because the sea is more beautiful on dry season!